Ayers pear trees can reach ups to 30 feet tall and grow best in USDA hardy zones 5 to 9. This fruit tree is part of the Rosaceae family. The Ayers pear tree produces clusters of showy, aromatic, pink and white flowers among green leaves in early spring, which form into sweet-tasting fruits when properly cared for. Plant your Ayers pear tree in a sunny location with well-draining soil with a pH range of 5.5 to 7 and begin care right after planting. Plant the Ayers pear tree in the spring as soon as you can work with the soil. Dig a hole the same depth of the container and twice as wide. Place the tree in the hole and backfill with removed soil. Use the remaining soil from the hole (or from elsewhere) to create a watering basin around the planting hole of the tree. Fill the basin with water, and allow draining. Add more soil to the basin wall or planting area, if needed, for any leaks or settling that occurred from watering. Fill the watering basin one or two times a week, if it rains less than an inch. Continue to water, as needed, throughout the growing season. Cover an area extending out 3 feet from the newly planting Ayers pear tree with 3 to 6 inches of mulch. Keep the mulch at least 6 inches from the tree trunk. Mulching the area will prevent weeds and help maintain moist soil. Watch for new growth on the tree a few weeks after planting. Apply a nitrogen fertilizer in a 1-foot circle around the trunk of the tree. Water the tree thoroughly after applying fertilizer. 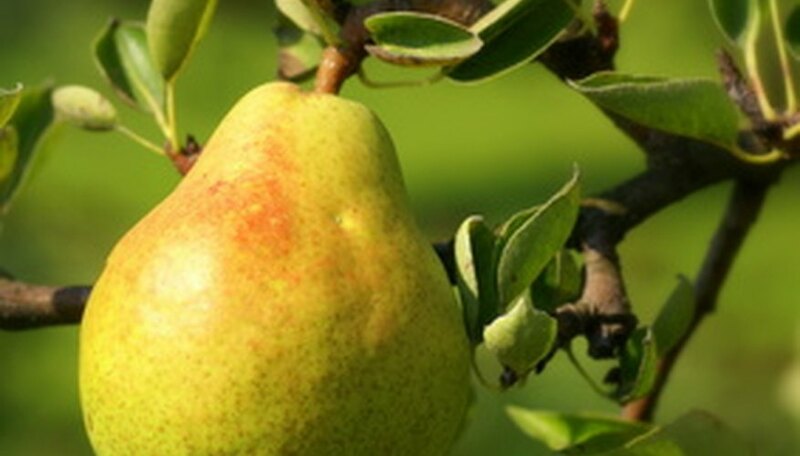 Prune the pear tree to remove diseased, broken or damaged branches at any time. Shape the tree while it is dormant into a cone-shaped or central leader system, which consists of one leader with three or four lateral branches. Cut any branches under 18 inches and any suckers growing on the bottom area of the trunk.